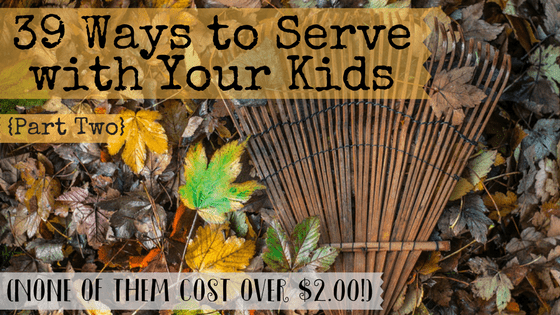 This is the second post in a three part series about family service projects to do with your kids. If you missed the first post, you can go back and read it here. 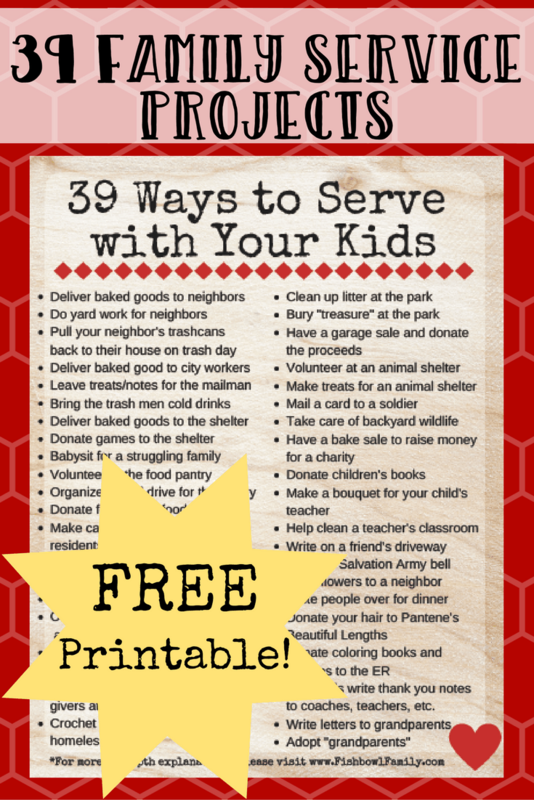 If you’d like a free PDF of all 39 ways to serve with your kids, sign up at the bottom of this post, and it will be sent right to you. It may seem ambitious to get kids to do family service projects. Sometimes, just getting my kids to clean up their own cereal bowl in the morning is a like battle between two gladiators in the Colosseum. We face off around the kitchen table. The other kids are on the edge of their seats to see who will ultimately win this contest of wills. By the time it’s over, we are both sweaty with bruised egos. So the idea of taking my kids to do volunteer work for other people seemed very overwhelming at first. I just knew that they were going to balk at the idea and embarrass me once we got started. We talked at length beforehand about why we serve. We read passages from the Bible and discussed them. The kids make a list of people who we could serve. On the big day, I started making brownies to take to our neighbors. I was in a hurry so I didn’t let the kids help despite their repeated requests. I gave everybody jobs to do while I was making the brownies because we still needed clean dishes and folded clothes, and I certainly couldn’t do it because I was baking brownies. My family didn’t move fast enough, and the kids kept acting like goofy kids. And then, I realized there was one thing I forgot to do. I forgot to adjust my attitude. I put “take brownies to neighbors” on my to-do list like it was just another thing to get done. Treating it like this made me forget the true purpose of what we were doing. Baking brownies and delivering them to my neighbors wasn’t shouldn’t have been just a chore to check off. It was an opportunity to love my neighbors, get to know them, see their needs. To invite them to church. To be part of their life. Not just drop some brownies and run. So be sure that you are ready to serve. Here are thirteen more family service projects (read about projects 1-13 here). There are many people in nursing homes that don’t get any visitors which really breaks my heart. People are often scared to go because they’re worried it will be awkward. Let me reassure you, it will. But God didn’t call us to love others as long as it’s not awkward. When I think about some of the situations Jesus was in during his ministry, I know they had to be super awkward. So get some craft supplies out for your kids and make some cards. While you’re making the cards, talk to your kids about what to say to the residents and more importantly, what not to say. The front desk can tell you which residents get the fewest visitors. We like to start there. The great thing about bringing kids with you is that you can deflect the awkwardness onto them. Anyone that will yell out in a dinner party that they need help wiping has no barometer for awkwardness. Make the most of it. Once you’ve built a relationship with several residents, you can talk your kids into giving away some of the 7,000 prized pieces of artwork they bring home from school each day. Make sure you talk to the nursing home first because many nursing homes keep a pretty busy schedule. But this is a great group ministry opportunity. You could invite some friends or your Sunday School class to participate and make it as low key or hyped up as you want. You just pick a date, grab some games, and show up ready to play and talk. Some people will just want to talk to someone new, some people will play Monopoly like it’s real money, and some will sit to the side seemingly unengaged. Again, make sure to talk to the nursing home first to find out about their schedule. They’ll also be able to let you know which residents will be able to participate. This is probably another project best suited for a group because giving manicures and pedicures can take a while. And before you say anything about how gross feet are, please remember that Jesus spent his last night on earth washing the feet of men who walked everywhere they went and wore handmade leather sandals. He even washed the feet of the man who he knew had betrayed him! I think we can all paint some toenails. As always, talk to the nursing home first. This can be as simple or fancy as you want it. You could simply bake a cake and make cards for all the residents with birthdays that month. You could get a group together and buy a cake, snacks, decorations, cards, gifts and make it a huge party. Fresh flowers brighten up any space, even a nursing home room. I know that many nursing homes try to make the spaces feel homey and comfortable, but I’m not sure it’s possible to make a sterile space feel truly homey. A fresh bouquet from your yard or a nearby field won’t cost you anything but time. You could even save jars from spaghetti sauce to use as a vase. The recipients won’t mind Prego on the side of their vase. This project is especially great for residents with alzheimer’s. They may not remember your visit tomorrow, but seeing the flower and a note will tell them all over again that they are loved. The people who work at nursing homes have a very hard job and it is mostly thankless. All day long they deal with people who are ill, incapable of caring for themselves, and/or are suffering from chronic illness. As much as the workers may love their job, the day in and day out of that environment can wear even the most optimistic person down. A homemade card acknowledging the difficulties of their profession and thanking them for doing it anyways could mean the world to them. You could also bake a batch of cookies or brownies and attach a treat with each card! Despite many promises to myself to learn how, I cannot crochet. I wish that I could because these sleeping mats look pretty awesome! They are made out of used plastic grocery bags so they also serve as a way to recycle and are totally free to make. This video tutorial takes about five minutes to watch. This one is pretty easy. Just grab some trash bags and gloves and head to your local park. Depending on how helpful your kids are, picking up all the trash should still leave plenty of time to play. Have your kids go through their toys and choose some especially “treasure like” toys (cheap necklaces, fake coins, dinosaurs, etc.) they’d like to give to another child. Go to the park and bury the treasure together. This is also a great way to clean out some unwanted toys! My kids would be ecstatic if they were playing in the sand at our park and found some buried treasure! Kids love animals, especially if their parents don’t. Nothing adds to the chaos of morning time like hearing the words of Vanessa Huxtable coming from your child, “Can we get a dog?” Let your children have the joy of ownership without the permanence by letting them volunteer at a shelter. Shelters always need people to help clean out cages, feed the animals, and walk the dogs. Depending on the age of your child, there might even be some administrative tasks they can assist with as well. There are lots of good recipes for homemade dog treats on the internet, and most of them are simple enough that your kids can actually help make them. Or if you are working on letting your child cook alone, dog treats are a great place to start! They’ll get all the great experience of following written directions, measuring ingredients, etc., but no one in your family will have to eat the food if it doesn’t turn out great. Once the treats are made, take them up to the animal shelter and play with some of the dogs. Serving our country through military service requires sacrifices. In a 2014 study, researchers found that “the rate of major depression is five times as high among soldiers as civilians” (JAMA Psychiatry, March 2014). Obviously, a card from your family isn’t going to cure depression for a soldier who is deployed, but you may be able to remind him or her how very loved they are. A heartfelt card could start a relationship with a person who desperately needs Jesus and is in an isolating situation making them ready to hear the good news. There are a number of organizations that can put you in touch with a soldier. If you would like to start an ongoing correspondence, you can register to adopt a soldier at adoptaussoldier.org. Another option, if you just want to send a single email, is USO.org. They have a great tool to do just that. A much safer way to show love to God’s creatures is to cover pine cones in peanut butter and bird seed and hang them in the trees. This will serve as food for the wildlife for the winter, AND keep them at a safe distance. This is a project kids can do mostly by themselves, but I’d probably give them their own “special” jar of peanut butter because I don’t like pine cone bits in my PBJ. The last thirteen family service project ideas in our series are posted here. If you sign up for our mailing list below, we will send you all 39 ideas in a cute PDF that you can print and hang in your house as a visual reminder to be servants of all. This post!!! 🙂 “Sometimes, just getting my kids to clean up their own cereal bowl in the morning is a like battle between two gladiators in the Colosseum.” epic line haha. My daughter is only 18-months, but soon enough she won’t be, and I would like to come up with ways to get her to serve others with me. This is so important, and I LOVE your ideas! Especially 15 (elders really enjoy when you come to play games with them!) and 23. I am going to sign-up to download the full list! Thank you! I have an 18 month old son, and I just love this age! They’re so fun! I’m glad you liked the post, and I hope you like the printable! Great ideas! And I had to laugh out loud about your ‘brownie’-story – I can relate! It’s easy to forget to do things with purpose. It’s not just about what we do, but *how* we do it. Thanks for this! Giving back as a family is the best way to instill values like compassion, kindness and open-heartedness. 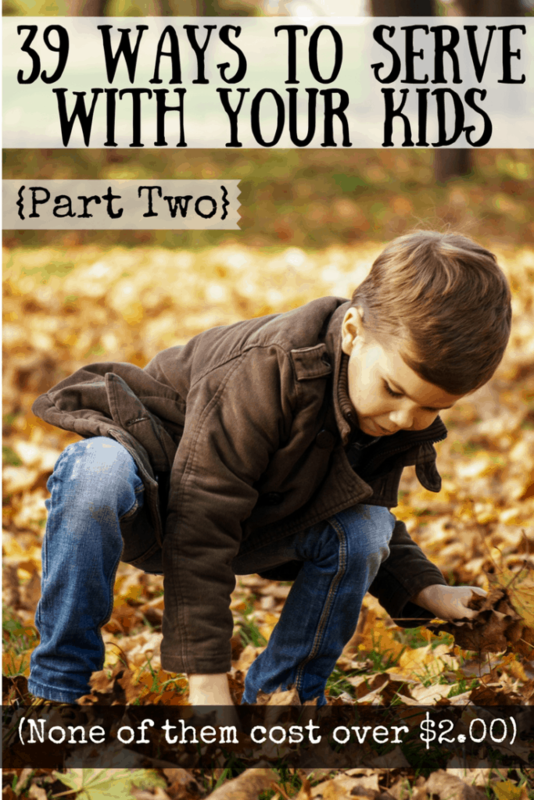 My kids and I try to do good often—we’ll do some of these activities next! Catherine, I totally agree! It’s not enough to tell our kids about values, we have to show them. I hope y’all find some new activity ideas on the list!